The violent partition of 1947 and the continuing conflict in Kashmir have permanently embittered the two neighbors. But whatever be the state of their bilateral ties, there’s one place where the two sides meet every day without fail – at the border between the two countries a dramatic daily parade has attracted visitors for decades. But as Bismillah Geelani reports, there are concerns that this daily fanfare is pushing the rival nations further from peace. At the India-Pakistan border, thousands of men, women and children have gathered to watch a stunning ritual: On either side of the border, military march back and forth, as music roars and crowds cheer. They’re marking the edge of the nation in a parade called ‘beating the retreat ceremony.’ Every day since 1959, as flags are lowered at sunset, this ritual is performed. The parade has survived despite very tense relations between the two countries. The atmosphere is festive with loud music and patriotic slogans filling the air. On this side of the border, people have painted the Indian tricolor on their faces. They wave paper flags, and break into dance as patriotic and Bollywood songs blare over loud speakers. The crowd cheers them on. The commander on the Indian side shouts a battle cry and about a dozen armed soldiers follow him to the iron gates that separate India and Pakistan. Wearing Khaki uniforms and red-fanned turbans, the soldiers are forceful and aggressive -swinging their arms, stomping the ground vigorously and performing high kicks that nearly bring their legs to their foreheads. Sumer Sing says the soldiers are specially selected and groomed for the job. 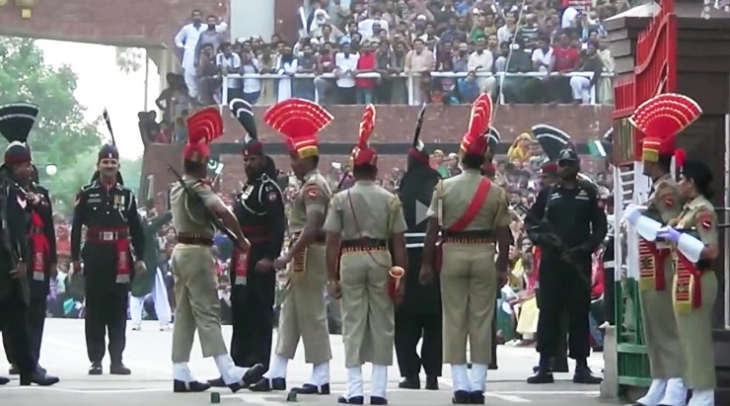 As the border gates on both sides are thrown open, the Pakistani rangers in black uniforms and matching fanned turbans appear performing similar moves. The crowds go berserk and chants of “Hail to mother India” on the one side and “long live Pakistan” on the other, grow louder and louder. After the show of strength and an exchange of menacing looks, soldiers from both sides lower their respective flags. The parade was initially intended as a gesture of goodwill between the governments. But it has turned bitter and aggressive over the years - a true reflection of the declining relationship between the two neighbors. The fierce competition, rivalry and mistrust between soldiers is visible both during the parade and after it. Ironically though, as Sumer Singh explains, the ceremony is truly a joint venture, shared and agreed upon by the two countries. But the way the parade is used to arouse nationalistic passions and promote jingoism is causing concern among many who strive for better relations between the two nuclear armed neighbors. “This site is also a reminder of what we chose not to recognize along with our independence and emergence as separate nations,” said Devika Mittal coordinator of a group called Aghaz-e-Dosti, or the beginning of friendship. “Our separation or partition came at a heavy human cost. Millions of people were displaced on both sides. People were killed, raped and they got separated from their families. At that time there might have been no border gates but the space was the passage for the migrants and it continues to mark those memories,” she commented. Back at the border parade, after the last bit of powerful stomping, twirling of moustaches and exaggerated rolling of eyes, the soldiers shake hands and the border gates are again slammed shut. The choreographed show of aggression comes to an end, just like a fiercely fought India-Pakistan cricket match. With strong political will on both sides, Devika argues the same ceremony could be used to sow the seeds of lasting peace and friendship between the two neighbors.